In many areas there is still a lack of regulatory and public acceptance to champion the recycling of alternative fuels, despite evidence of overcrowded landfills, and in some cases the offloading of household wastes into other jurisdictions. Alternative fuels have gained momentum in some areas, as plants strive for increased efficiency. Rubber tyres have been a particularly successful fuel in both preheater and precalciner kilns with their introduction at the preheater riser duct area. 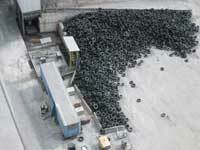 Long wet and dry kilns have also added mid-kiln tyre introduction with equal success. Expired shelf-life corn seed was fired in one plant where it actually supplemented the annual fuel bill by about 50%. Other plants have found value with the use of petroleum coke (petcoke), where some plants successfully fire 100% petcoke, giving substantial savings. Treated waste sewage, too, can often provide income through calorific supplements, tipping fees and environmental improvements. At one plant, digested sludge is injected as a NOx reducer. 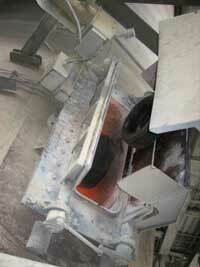 The ammonia in sludge reacts chemically to reduce the NOx by about 60% of the remaining NOx. Burning in-plant waste oil has cleaned up some plants, when permitting allows this practice. Many other alternative fuels have been tried successfully, such as; rice husks, hospital wastes, waste wood fibre, animal wastes and many others synonymous with particular regions. It is well known that some alternative fuels may contain chemical constituents that may not be conducive to cement kiln efficiency, which can lead to excessive recycling elements, increased preheater build-ups and disruptions to production. Therefore, the feed proportions of the fuels have to be managed to assert benefits, without over indulging to the point of hurting the operation. For maximum benefit, the fuel must be delivered to the kiln system in a constant manner so calorific deviations are minimised. This means sensors, automatic controls, and gas analysers need to be in top condition and tuned to a high degree of reliability. As with all waste material usage, the real costs considering production rates, recycling elements, build-ups and impact on the environment need to be rationalised, as well as the bottom line. The message is clear... recycling efforts must increase. Although household wastes have been successfully collected and recycled into some manufactured products, there are many countries that still do not recycle at all. Recycling selected household wastes is essential for our planet’s future prosperity, and it will take work and ingenuity to manage this efficiently. If this waste cannot be recycled as part of a manufactured product, then it can possibly be used as alternative fuels in cement plants. By proper collection capability and packaging for consistent calorific value, the potential gains could be enormous. All sectors, governments, regulators and the public must strive towards better recycling efforts to realise these potential rewards.